Classes are based on battery cell count and model type. Example: 3S. That defines any multirotor on 3 cells. 4S. That defines any multirotor on 4 cells. Vortex Class. That defines the Immersion Vortex ONLY in stock form. Beginner series will be run if enough entrants warrant. Beginners will not be required to go through the gates. All other classes must complete all laps using gates and or obstacles. There will be NO point accumulation for beginner races. Number of participants will determine the number of qualifying races for each class. Racers MUST finish a qualifier to advance to the main events. A Last Chance Qualifier will be held for any racer that does not complete a qualifying race, but only the winner of that LCQ advances to the main. Races are ground start, from a marked starting grid. There is an audible race starting program that runs and gives you the countdown. The Audio file gives you 5 minutes to get your FPV frequency ready, and get to the starting grid. If you are not at the starting grid in time, the race starts without you. The file gives you countdown increments of 30 seconds until the last minute, then counts down in 15 second until the last 10 seconds before the start. The Start is on tones: Beep, Beep, Beep, Beep, BEEEEEEP! Go on the last (5th) tone. Racers that miss gates, can turn around and complete them. It is based on the honor system. If you miss a gate, do not continue until you can turn around and complete it. Racers will need to know their position for finish. The announcer will call the winner but it is up to the pilot to announce their crossing of the Start/Finish line. 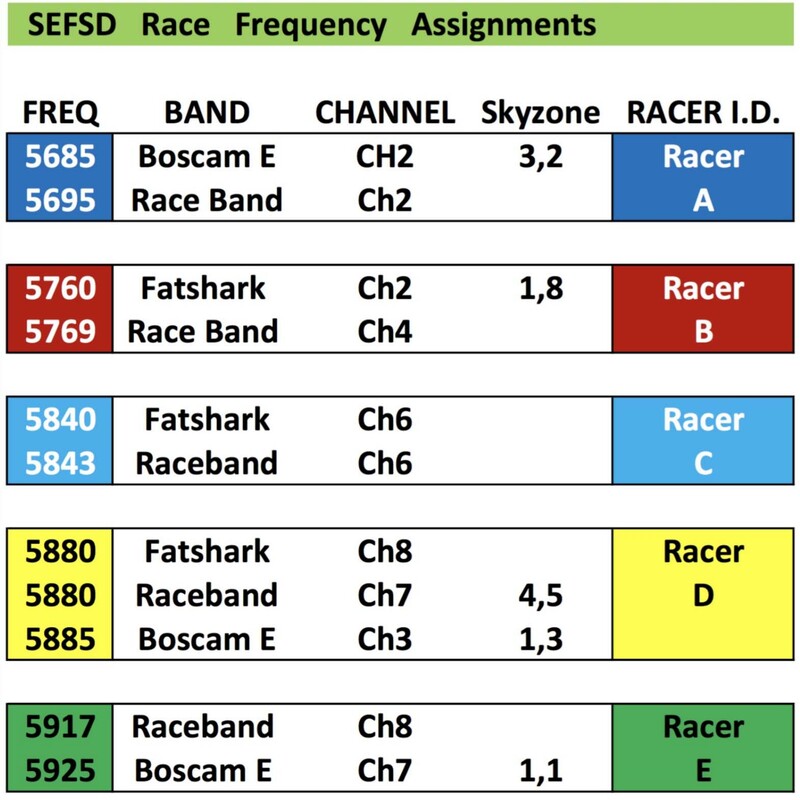 FPV Frequencies are assigned on race day. Maximum 250 Mw transmitters only (unless specified otherwise). Be prepared to swap channels between qualifiers and main event races. Racers will be assigned a FPV Racer letter designator, A~F. They can use any channel within their designation. Racers must be able to easily access the VTX to change channels as necessary. Races are 3 laps. Racers get 1 qualifier to give them main event position. Racers are limited to 2 classes during registration. Registration is at 09:00 ~09:30 on race day. Racers who do not register by 09:30 will not be able to race. In our upcoming FPV quad race, we will change the format. The purpose of the change is to streamline the process so we can be in line with how the professional race events are done. This will allow us to do more flying in less time. Lower the mistakes we’ve had in placing pilots in the incorrect heats. Finally, lowering mistakes in the tournament point scoring. The format is simple and the end results will still be the same where we have the A, B, C, etc Main heats as well as the points for the Mains are the same. There will be 2 qualifying rounds. This is not a race against the pilots in your heat, it’s racing to get the best 3-lap time. Your best time will determine your placement in the Main heats. There will not be any Last Chance Qualifier round. If you crash, then you have another round to try and complete three laps. If you do not finish all 3-laps, then we will place you accordingly. (i.e. If you have the best 2-laps finished, then you will be placed right after the slowest 3-lap pilot who finished). The pilots in each heat will be randomized by the LiveTime software. We may do some shifting if we see a heat not balanced between experienced and inexperienced pilots. You will be assigned a frequency that might change between rounds. Each heat will have either 3 or 4 pilots per heat with an occasional 2 pilot heat depending on the number of pilots that register for the race. If there is a tie for the last position of any of the Main heats, then the tiebreaker will be determined by your next slowest heat. The mains will have 3 or 4 pilots per heat. If we have an uneven number of pilots to fill all Mains, then we will load the lower mains (e.g. C or D) with more pilots. The higher mains (e.g. A and B) with less pilots. Please make sure to double check the heat printout for your frequency as they may change between rounds. In conclusion, the points for the tournament have not changed thus keeping it consistent since the beginning of the season. Everybody will be guaranteed 3 heats to race in. If all goes well, we will be able to finish much earlier than before. If you have any questions, please direct them to Scott Fuller or Chuy Wong.